Mirror download links for HP71 can be found here and here. Since Gui worked so hard to give birth, how could we end without witnessing the fruit of his labor? 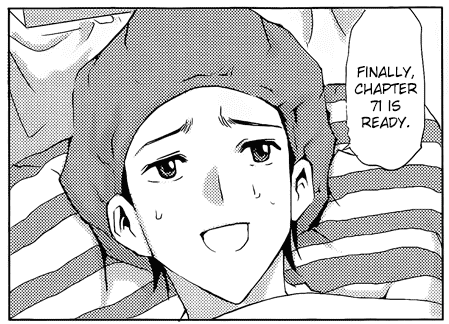 I hope everyone has recovered from the multiple shocks and surprises in chapter 70! Without further ado, may we introduce Chapter 71~! Congratulations to our new parents, Gui and Lan Feng! It's a healthy baby... girl? I have the same problem, CAUTION! From your IP range the limit of connections is reached. Hope you can add a mirror link. Um, isn't MIN the family name, hence her name would be Lan Lan MIN and not Lan Lan Wen (which was Ju's MIDDLE name?) I recall seeing and someone mentioning this mistake in the previous chapter. I see it as more like the story finally coming full circle. Thanks for the feedback guys! I'll try get a mirror up asap! (removed previous comment since you can't edit comments). THANK YOU YU (pun intended) AND ODD SQUAD SCANLATIONS for bringing us this series!! I remember discovering this at the top of OneManga.com's alphabetical manga list with only 5 chapters. Out of the many *hundreds* of manga I've read in my life this has over time become the #1 in my top 5 favorite manga. Shouldnt their names be Feng Lan (in this post) and Min Lan Lan? Zephynel here. The translation to "Lan Lan Wen" was a mistake on my part. hi, i can't wait for the next chapters.